In Roppingi, there are several large museums you can visit such as The National Art Center, Tokyo, The Mori Art Museum and the Suntory Museum of Art as well as smaller galleries. You may also come across art work and pieces in various establishments and facilities around Roppongi. Also, if you take a look just outside Roppongi Hills or Tokyo Midtown, or if you walk around the streets of Roppongi or go into the parks, you can find pieces of art or design objects (public art) all around. Be sure to take the time to go and experience the wonderful works of art. 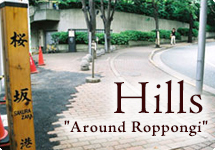 The area around Roppongi has many hills. Geographically, Roppongi is on elevated ground so if you go in any direction from the Roppongi crossing, you will go downhill. It sits on higher ground so that you can overlook the surrounding areas. In the old days, it was a Samurai residence, but recently embassies and other such buildings line the streets in the area. When you go out for an enjoyable lunch with a date or a friend, or with work buddies, of course, you want something delicious to eat, but good service and a nice ambience is also important. 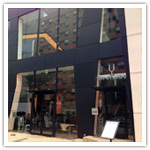 At this time, we would like to recommend the restaurant "UPSTAIRS". 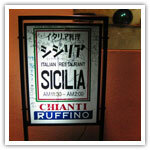 "PORARI TOKYO Roppongi" We are here at the Italian restaurant, "Sicilia" which opened in Roppongi over 60 years ago. Three generations of happy customers, TV entertainers, people from foreign countries, and people of all ages continue to enjoy meals at Sicilia. 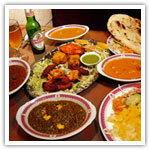 Indian Restaurant "MOTI" Roppongi has a history of almost 40 years. Indian spices and fragrances fill the air. Come and enjoy the experience! 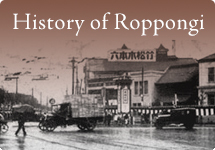 From Edo to Meiji periods, what was once a quiet residential area of Roppongi, underwent a transformation and a fashionable town was created. Roppongi is the site of the historical landmark, the Japan Geodetic Datum, designated cultural property of Minato-ku and appointed on October 22, 1996. 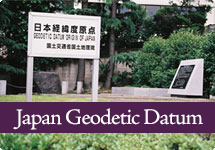 It is here that the Japan Geodetic Datum was established to serve as a reference for determining the standard for the country's longitude and latitude. It is also used as the starting point of the country's geographical surveying.